Ian and I went to New Zealand for two weeks in February, and one of the most delicious discoveries was Bumper Bars, a quasi-granola bar/candy bar thing that we pretended was healthy because we were On Holiday. The apricot-chocolate one was the best, and I’ve been wanting to recreate it since. So I scoured the internet, found a Real Simple recipe, and made some improvements – i.e. added more chocolate and more apricots. I made them with the idea that I would take them to work for breakfast, but Ian and I scarfed a third of the pan before they were even cool. We’re calmed down, sliced them up and put the rest away, but its clear that my vision of a healthy granola breakfast bar hasn’t panned out – they are a victim of their own success. I’ve been using Smitten Kitchen’s breakfast crumble recipe for a few months now – so much so that the guy at the Turkish International Supermerkert has commented on my plum consumption (he also asked me if I’d been swimming yesterday. I hadn’t, I was just that sweaty after zumba class). I keep upping the size of the recipe and we keep eating it, and its a really easy way to prepare a week’s worth of breakfasts in one go. Finally, I got into cacao nibs a few months ago, when I made cacao-banana-coffee muffins, which are delicious. But the enduring success from the cacao experiment was refrigerator oatmeal, which I have been making several times a week since November – you soak oats overnight with milk, sugar, cacao and fruit. Since I am less of a dirty hippie than I used to be, I use milk and processed sugar. I eat it on the train while glaring at people doing their make-up (I mean seriously. I wish women would stop wearing makeup in general, but barring that, I wish they would stop putting it on while sitting next to me on the train). I’m really sensitive to the smell of it, which makes me sneeze, and watching a woman with an eyelash curler in a public place just grosses me out). Dang, Franny; that’s three recipes in one blog post that I might actually try. You’re going to make me fat. it’ll take more than granola bars to make you fat. 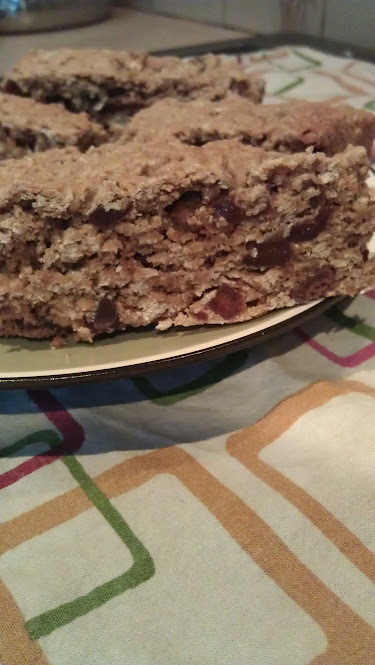 I have been looking for a recipe for the apricot chocolate bumper bars since I visited New Zealand last March. My girlfriend is a Kiwi and she loves them, but they are insanely expensive to buy in the US…like $4 each. I noticed with the recipe you posted that some of the ingredients in the actual bumper bar were missing and thought I would suggest them as an add to improve the recipe. Sunflower seeds, sesame seeds, coconut and golden syrup are all in the bars you get in New Zealand. I will experiment with your recipe and add these ingredients and see how close I can get them to the original. Thanks for posting this. You are exactly like we are in respect to those NZ Bumpers. Thanks so much for going to all the work to create a recipe for all of us! We just got home and are in Bumper withdrawal. Clif Bars are healthier, but we’re getting older so it’s time to just seize the day, I think–or at least the Bumper!